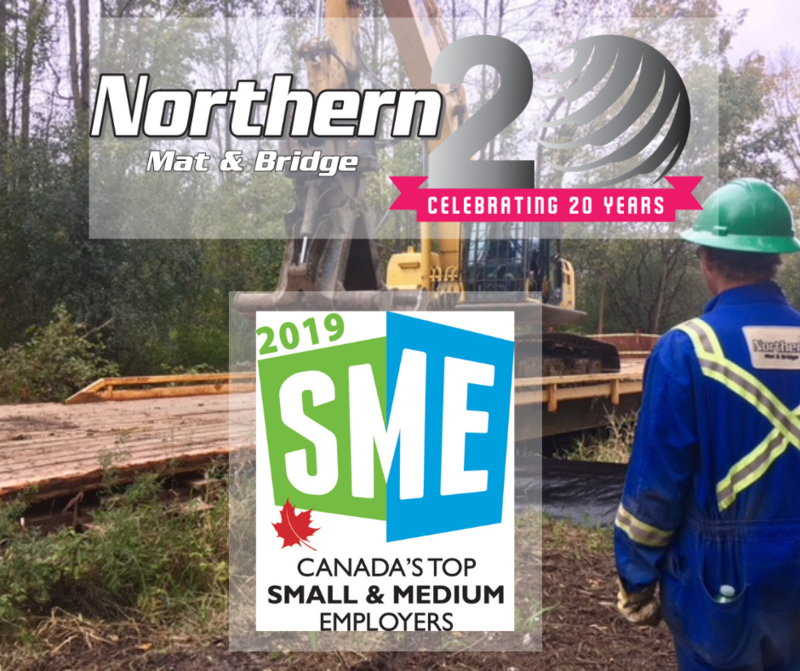 April 12, 2019 – Today, Northern Mat & Bridge LP (NMB) was named one of Canada’s 100 Top Small & Medium Employers for 2019! This is the first time NMB has be awarded this achievement. This award is part of the of the Canada’s Top 100 Project run by Mediacorp Canada Inc. (Mediacorp) and showcases the nation’s most innovate smaller employers and recognizes their outstanding achievements in creating exceptional and industry-leading workplaces. Winners were announced in a special edition magazine published in the Globe and Mail. The 100 winning workplaces are not ranked in any order. Canada’s Top Small and Medium Employers is an editorial competition that recognizes the small and medium enterprises (SMEs) that offer the nations best workplaces and forward thinking human resource policies. Employers are evaluated by using these 8 criteria factors. To determine eligibility , the Top 100 editors follow the SME definition used by Statistics Canada, limiting the competition to private-sector companies with under 500 employees. Interested in working for Northern Mat & Bridge? Please visit our careers page on our website! For up to date NMB and industry news, follow us on LinkedIn, Facebook, Twitter and Instagram! Founded in 1992, Mediacorp Canada Inc. is the nation’s largest publisher of employment periodicals. Since 1999, the company has managed the Canada’s Top 100 Employers project, which includes 19 regional and special-interest editorial competitions that reach over 15 million Canadians annually through a variety of magazine and newspaper partners. Mediacorp also operates Eluta.ca, the largest Canadian job search engine, which includes editorial reviews from the Canada’s Top 100 Employers project and is used by seven million Canadians annually. Mediacorp also hosts the Top Employer Summit, Canada’s largest conference for senior-level HR professionals.